These clear stamps cling to our uniquely designed acrylic stamping blocks–no adhesive necessary. 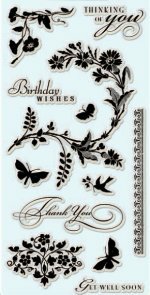 With its variety of sentiments and motifs, this stamp set is perfect for many stamping projects. Includes 12 images.